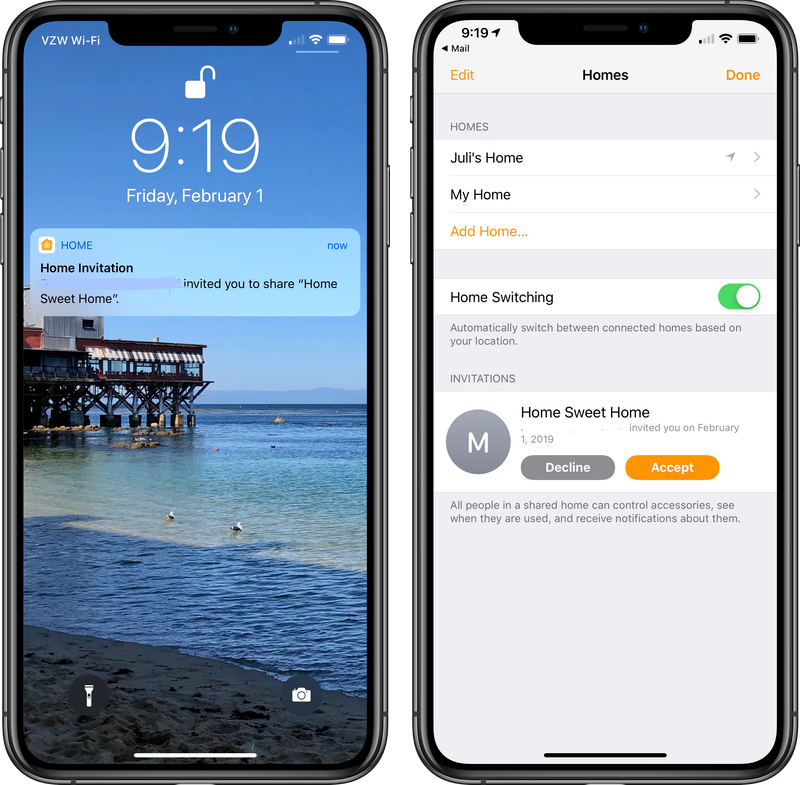 If you share your home with family or roommates, it often makes sense to share access to HomeKit devices with them so they can control your connected lights, blinds, thermostats, etc. As long as they use an iPhone or iPad running iOS 10 or later or a Mac running macOS Mojave or later, Apple makes it easy for you to grant them access via their iCloud account. On an iPhone or iPad, open the Home app and tap on the small home icon in the top left corner. In the People section, tap on Invite. Enter the iCloud email address of the person you want to invite, or tap on the "+" sign to find someone in your contact list. This process is nearly identical on a Mac, though you access the People list via the Edit/Edit Home menu. Once they've accepted, they'll appear in your People list. Tapping on their name will reveal an additional screen where you can toggle Remote Access on or off. Remote Access lets them control your HomeKit devices when they're away and not on your home Wi-Fi network. If you have a home hub, they can even control accessories by voice with Siri. If you don't have a home hub, they'll need to make any changes manually within the Home app. 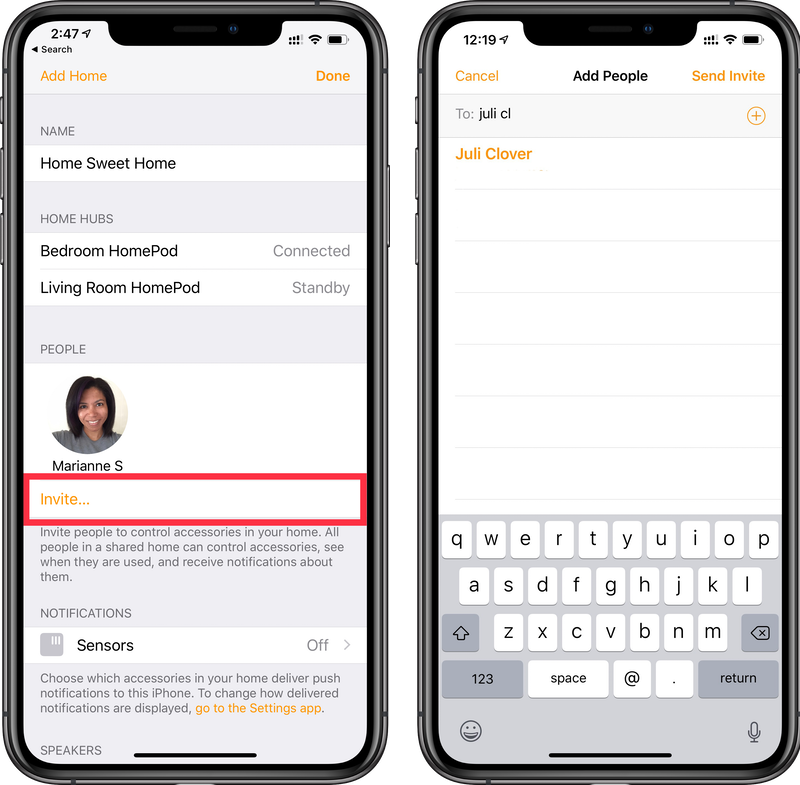 Toggling Allow Editing would provide them with more control over your HomeKit setup, allowing them to add and remove accessories or even invite other people to control devices. 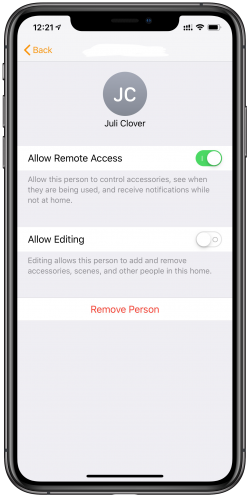 If you need to delete someone from your People list, you just need to tap on Remove Person at the bottom of this screen to revoke their access to your HomeKit setup.